As the famed Parisian watering hole shutters its doors, we talk to its soon-to-be sought after bartender-host before last call. 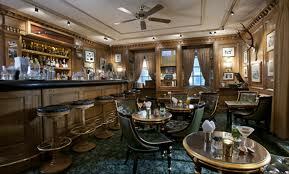 Over the past 18 years, Colin Field has made the Hemingway Bar of the Ritz Paris the city’s pre-eminent watering hole. More than a bartender, Mr. Field is a host with a knack for sparking conversation between his guests and approaches drink-making with the detailed eye of a tailor, often sizing up a customer’s personality and mood to create a made-to-measure cocktail. Considered by many to be one of Paris’s best bartenders, he will soon become the town’s most sought-after one as the Ritz prepares to shut down for a two-year renovation on April 16. Other hotels, such as Le Bristol in Paris’s chic eighth arrondissement, dream of hiring him. Mr. Field says he has been “asundered with propositions…[but] I honestly don’t know what I’m going to do.” Meantime, he is working toward setting up his own company and possibly making bottled cocktails for airlines and hotel minibars.